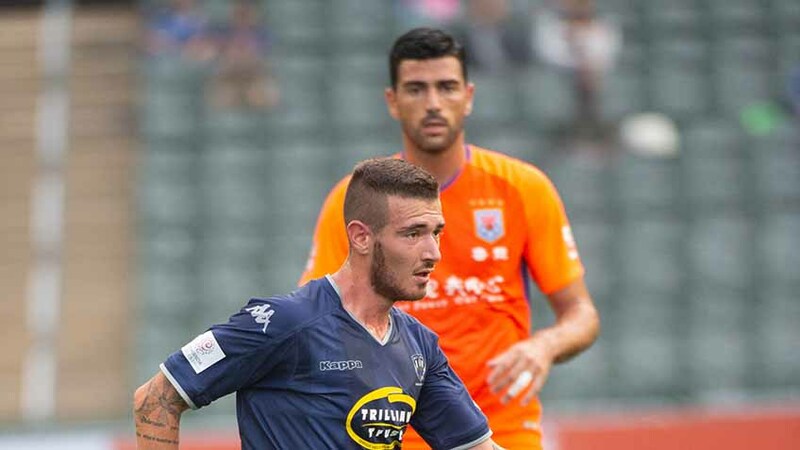 HONG KONG, China - Auckland City FC finished fourth at the Tonghai Financial Chinese New Year Cup after a 1-0 defeat to a Hong Kong League XI in Hong Kong tonight. The Navy Blues will look back on both matches at this tournament asking what might have been particularly the two key moments that involved a saved penalty and the referee's failiure to award a second. The first penalty came when Cam Howieson pressed aggressively and robbed Hong Kong of the ball in their own third before playing in Maro Bonsu-Maro who was bundled over inside the box. What happened next was sore viewing for Navy Blues fans when Fabrizio Tavano saw his fragile penalty saved easily by Chunhui Zhang. The cost of Tavano's miss proved expensive when just seconds later Awal Mahama scored as Hong Kong swept forward on a swift counter attack that left the Navy Blues scrambling. Down 1-0 at the break Auckland City FC regrouped and turned in a stirring second half. Dylan Manickum and Omar Guardiola each had chances either blocked or cleared and there were two spectacular efforts from Patrick Lundemo and the outstanding Micah Lea'alafa that produced similar outcomes. But the talking point of the second half though will be how referee Ho Wai Sing failed to award the Navy Blues a second clearcut penalty after Tavano was clearly felled in the box. The lack of accuracy in Ho Wai Sing's decision was made all the worse when it played out in all it's ignominy on the stadium's big screen. Hong Kong carved out two distinct chances the first when Fernando Augusto lashed a long range shot that Enaut Zubikarai tipped over the bar. The second chance was cleared off the line by Dan Morgan following a spate of corners by the home side. Coach Ramon Tribulietx was irked by the lack of a penalty decision by the referee but preferred to focus on the positives from the experience. "It is a frustrating situation but that is how football is sometimes. But there are a lot of positives to talk about when we analyse this tournament. "All of the players got a run out at this tournament with the exception of both goalkeepers. "Maro Bonsu-Maro, Yousif Ali and Alfie all showed a level of maturity in their game at this tournament against a very good Hong Kong selection. "It was a shame we missed the penalty and then conceded a goal immediately afterwards. "That hurt us psychologically but in the second half we readjusted our shape and pushed forward a bit more and created clear chances. "We created chances to score in both halves so we have to be happy with way the team tried to come back into a very difficult game under the circumstances. "We've taken a very rich experience out of this tournament," he said. One player who caught the eye of local media was Solomon Islands international Micah Lea'alafa. The pacey wide man was in top form as a second half substitute and caused Hong Kong plenty of problems. "Micah is capable of doing a lot with the ball and we asked him to pick up possession in deeper areas in between the lines which is very difficult to defend against. "Micah is a quick learner and we've asked players like David Browne, Dylan and Omar Guardiola to do similar things. "This is an important element of our football and there were some very good performances by some of our players and they can be proud of the way they played," he said. With more travel coming up and a tough domestic fixture looming on Sunday with the Wellington Phoenix, Tribulietx won't make any firm decisions on his team until they've returned to Auckland. "The Wellington Phoenix is an important game for us but we definitely need to assess how everyone is when we get home. "We've managed the workload of the team very carefully with most players getting 45 minutes in their legs with only Cam Howieson playing a full match. "There are three days before we play again so we have to assess following a light training session when we get home. "We're playing at Kiwitea Street and for a lot of reasons the Phoenix match represents three very important points for us given Eastern Suburbs and Team Wellington are playing each other as well," he said. Auckland City FC's next match is an ISPS Handa Premiership clash with the Wellington Phoenix reserves on Sunday 10 February 2019. The match kicks off at 2pm NZST. AC: 1. Enaut ZUBIKARAI (GK), 3. Takuya IWATA (Mario BILEN 46'), 5. Angel BERLANGA (c) (Micah LEA'ALAFA 46'), 6. Brian KALTACK, 7. Cam HOWIESON, 11. Fabrizio TAVANO (22. Omar GUARDIOLA 77'), 12. Dylan MANICKUM (8. Albert RIERA 69'), 14. Jordan VALE (16. Yousif ALI 56'), 19. David BROWNE (13. Patrick LUNDEMO 46'), 21. Maro BONSU-MARO (15. Dan MORGAN 46'), 23. Alfie ROGERS (20. Te Atawhai HUDSON-WIHONGI 84'). SUB NOT USED: 18. Ruben PARKER (GK), 24. Cameron BROWN (GK), 2. Joshua JONES.